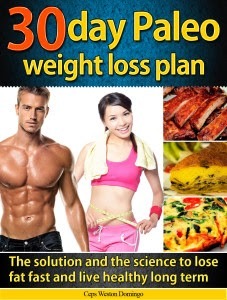 Ceps Domingo's "30 day Paleo weight loss plan: The solution and the science to lose fat fast and live healthy long term" is a comprehensive book on losing weight and keeping it off, as well as improving your health overall, with the paleo diet. The book begins by telling you why it is important to lose weight, citing the various health effects. It then goes onto the basics of the paleo diet, from what to eat to what not to eat. One of the strengths of this book is that is covers EVERYTHING associated with the paleo diet. You'll find everything from information about building lean muscle to information about how the diet can help with diabetes and free radical damage. The book acknowledges you want to still live an enjoyable life, and it gives you healthy, simple ways to lose weight, without sacrificing quality of life. It also has recommendations for people who are athletes and want to eat healthy and exercise right to perform better on the field. The highlight of the book is that it is backed up by lots of scientific references, so the author's claims are substantiated. Overall, if you want to take the paleo approach to getting healthy, this is your one-stop shop; it has everything you need to know about the paleo diet and its alternatives.